Gilbert’s tooth is wiggly and loose all through spelling and lunch. Then he scores a run in kickball and—BAM!—his tooth is knocked right out of his mouth! Gilbert is so excited that the tooth fairy will be visiting. 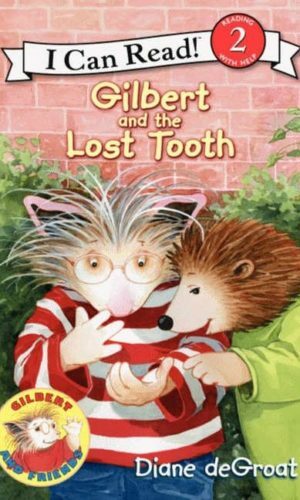 But Lewis is jealous of Gilbert’s lost tooth and comes up with a sneaky plan. Will the tooth fairy fall for Lewis’s trick? Before you begin reading the story, talk to your child about losing their teeth. Whether they’re excited or scared, let them know that it happens to everyone and together you can see what Gilbert’s experience is like! When Gilbert arrived at school, all he could think about was his loose tooth. What were his classmates’ (Patty, Frank, Margaret, Lewis) reaction? Why do you think Lewis was being so mean to Gilbert? Should he have been so mean? During their game of kickball, what happened to Gilbert and where was his tooth? When Gilbert arrived at home, he was very upset about his tooth. What did his mom suggest he do? What did his sister, Lola do? What did Lewis do that night? How did the tooth fairy find Lewis and Gilbert that night? How did she realize the tooth under Lewis’ bed was not his? What did Gilbert, Lola, and Lewis find under their pillow when they woke up? What happened to Lewis the next day on the playground? This book also shares a great message that everyone’s body changes at different times but it’s not a competition. This is a great time to introduce that message to your child. Whether they’ve lost 1, 5, or no teeth by now, all his/her friends may be losing teeth at different speeds and that’s okay. What matters is that everyone encourages each other to be excited about it.